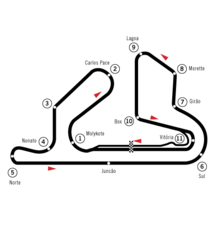 The 1982 Brazilian Grand Prix was a Formula One motor race held at Jacarepaguá on March 21, 1982. It was the second round of the 1982 Formula One season. Nelson Piquet finished first and Keke Rosberg finished second, but both were disqualified after the cars were found to be underweight. As a result, the FOCA teams boycotted San Marino GP two races later. The problem was with a 7 US gallons (26 L) "ballast water tank", ostensibly used to cool the brakes. This would gradually empty during the race and then be replenished at the end so as to pass post-race scrutineering. The FIA Appeals Tribunal upheld the disqualification seven weeks later and these tanks were permanently banned. Last race for Carlos Reutemann. The first win in the Brazilian GP for Alain Prost, who recorded six wins in total in the Brazilian GP (1982, 1984, 1985, 1987, 1988 and 1990). First and only points: Manfred Winkelhock. Many drivers suffered exhaustion because of the intensely hot weather, particularly Brabham drivers Nelson Piquet and Riccardo Patrese. Patrese was forced to retire from the race due to total exhaustion. Piquet, after having finished first in the race and then barely making it to the podium ceremony, fainted due to exhaustion. ^ Fearnley, Paul (April 2012). "The Commodore 64, Compact Discs and F1 drivers on strike: welcome to 1982". Classic & Sports Car. Teddington, Middlesex, UK: Haymarket: 234. ISSN 0263-3183. ^ Lang, Mike (1992). Grand Prix! Vol 4. Haynes Publishing Group. p. 86. ISBN 0-85429-733-2. ^ "1982 Brazilian Grand Prix". formula1.com. Archived from the original on 4 November 2014. Retrieved 23 December 2015. ^ a b "Brazil 1982 - Championship • STATS F1". www.statsf1.com. Retrieved 13 March 2019.